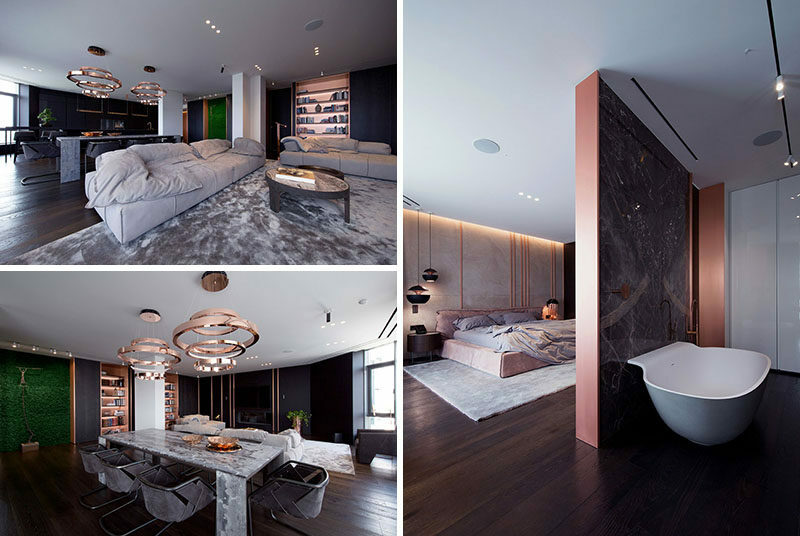 YoDezeen Architects have recently completed the interior design and renovation of an apartment in Kiev, Ukraine, that features copper design elements throughout. The architects took two smaller apartments and transformed them into one large apartment by removing walls, creating a large social area for the living room, dining area, and kitchen. In the living room, backlit copper shelves compliment the copper accents around the wall mounted television. On the wall that runs between the living room and the dining area is another copper-lined, built-in bookshelf, and an alcove that’s home to a sculpture with a backdrop of a moss wall. Two sculptural copper pendant lights hang above the dining table to anchor it in the open space. Next to the dining table is the kitchen. Black cabinetry is paired with copper details like wall panels, lighting and the faucet to create a bold and contemporary appearance. 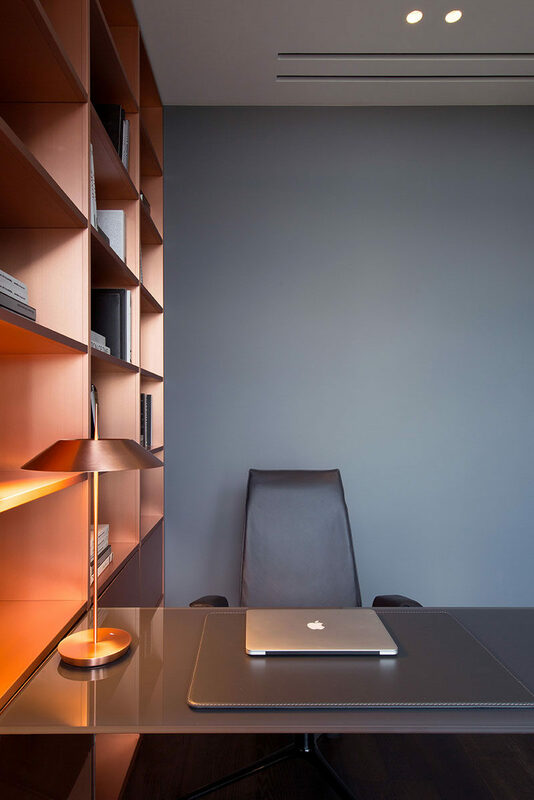 In the home office, copper shelving adds a metallic touch to the grey walls. Copper continues to be used in the bedroom, with copper pipes featured on the wall behind the bed. Hidden lighting creates a dramatic yet relaxed atmosphere. A partial wall with copper ends hides the bathroom from the bedroom, while keeping it open and spacious at the same time. 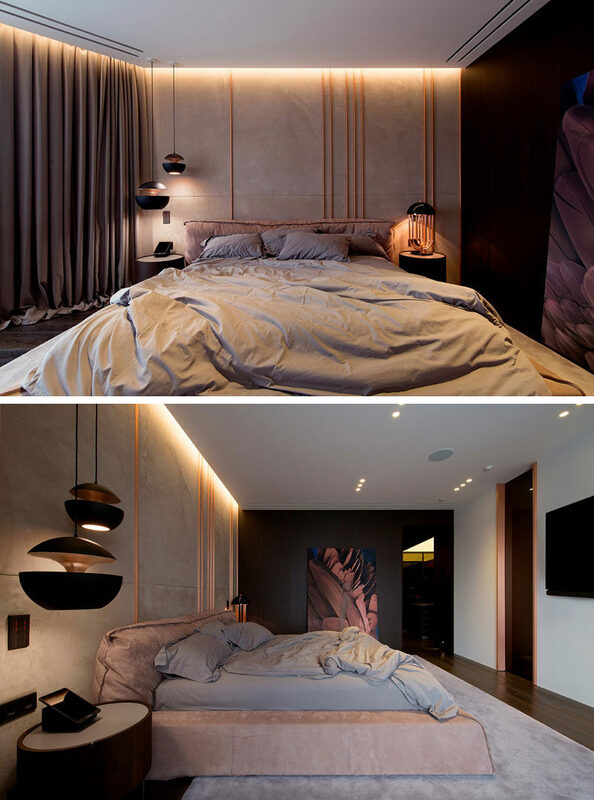 In another bedroom, dark wood has been used as an accent wall behind the bed, while a single copper light hangs beside the bed.